Custom moving requirements? Let Can Ridge take care of all the details! Every business has unique machinery and infrastructure that may not fit traditional moving methods or rigging. Can Ridge provides logistical solutions for any type of equipment, regardless of the size or weight. We will get your valuable equipment from one location to the next quickly, providing the utmost care for the safety of your assets. Can Ridge has every hoist, rig, crane and hydraulic lift that might be required to move your custom equipment. We take care of all the finer details so you can concentrate on the business at hand. Our team of commercial rigging specialists make sure to safely and securely rig your industrial equipment for safe lifting and transport during move. Crate and uncrate machinery and equipment – Custom machinery can be intricate and contain thousands of parts. We can help to crate this machinery in order to create a smooth moving process. We are also here to help unpack the equipment and rebuild the machinery. 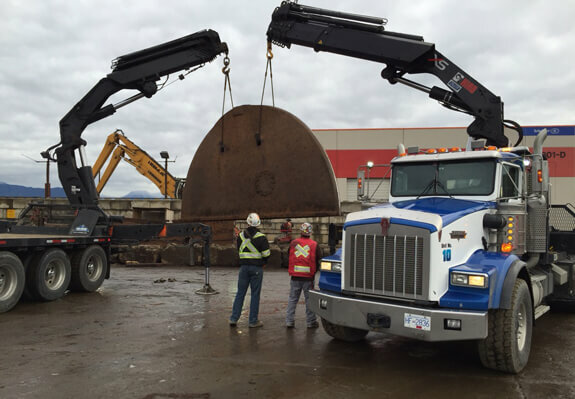 Load, unload and place – Moving machinery takes special care and attention to detail. Though many machines may look large and tough, a bump on the wrong side can damage the most critical device. We can help you to carefully load and unload your custom equipment. Provide on-site forklift rigging and hoisting services – While your team may include licensed forklift operators, moving heavy equipment requires a specialized skillset. Our experienced team, through constant communication and coordination, have completed hundreds of forklift rigging and hoisting moves successfully without any damage. Move equipment up and down stairs – A small distance can still cause a huge headache. We will help to set up rigging and hoists so that we can move your equipment up and down safely and efficiently.